Forbidden Island is a wonderful, easy-to-learn cooperative board game designed by Matt Leacock, the guy behind Pandemic (also fantastic). The game was a Mensa Select Game in 2010 and was nominated for the Spiel des Jahres earlier this year. The game has up to four players racing to acquire four treasures from an island before it sinks into the sea. What’s really great is that kids can play the game along with their parents, but the difficulty level can be ramped up for more experienced players, too. 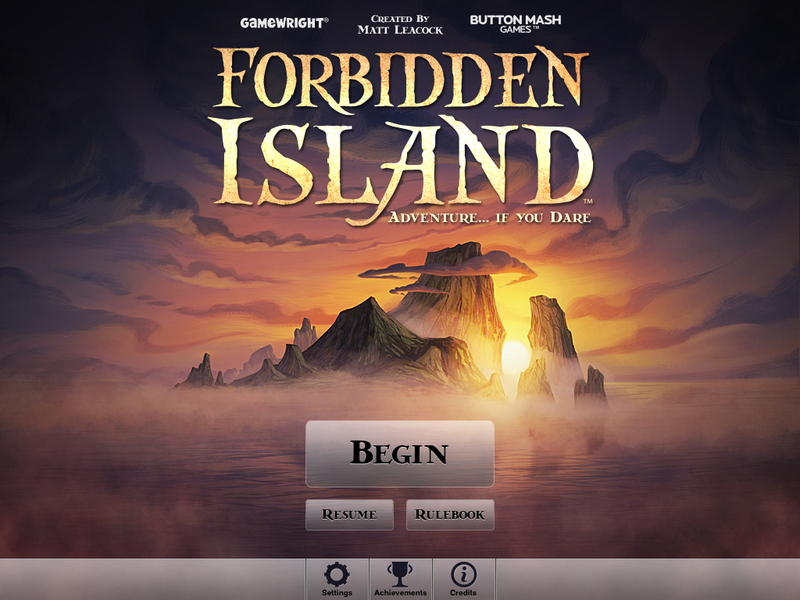 Now you can explore Forbidden Island from the (relative) safety of your iPad! The $4.99 app, released last week by Gamewright and Button Mash Games, is a pretty faithful reproduction of the game that takes care of a lot of the fiddly stuff you have to remember to do but retains the building tension and excitement of the original. It’s not entirely without its faults (but I’ve got my physical-versus-electronic leanings) but it’s still a pretty cool way to take Forbidden Island with you. For a more detailed explanation of how the game works, see my review from last summer, but here’s a brief summary. The island is made up of 24 square tiles. There are four treasures to be collected (representing Fire, Water, Earth, and Air) and each one can be collected from one of two locations. 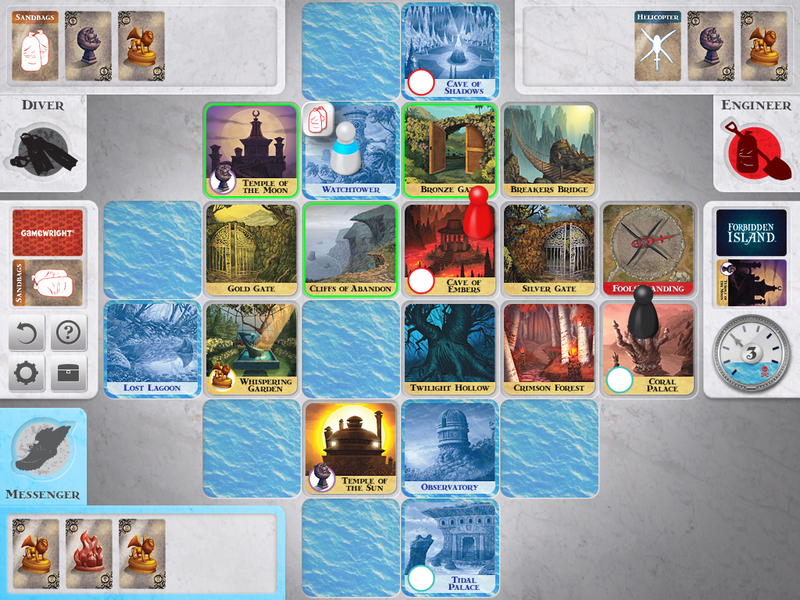 Each player gets three actions, which can be used to move a space, shore up submerged tiles, pass cards to other players, or claim a treasure. You need to collect all four treasures, get everyone back to Fool’s Landing, and play a helicopter card to get off the island. You lose if: both locations for a particular treasure sink before you obtain it, any player dies, Fool’s Landing sinks, or the water level reaches the skull. The app gives you a couple options when you start up a game: choose the number of players (2-4), a difficulty level (Novice, Normal, Elite, and Legendary), and whether you want to use Pass-and-Play or Tabletop mode. You can then do quick start (randomized roles) or select roles and optionally enter your names. The only difference between Pass-and-Play and Tabletop mode is the orientation of the text for the players on the “top” side of the iPad. In Tabletop mode, these are displayed upside down, making the text face the players on the other side of the table. Everything else remains the same. The app makes it pretty easy to play the game, with lots of visual tips. For instance, it highlights the current player (both their sector of the screen and their pawn on the board) as well as the tiles you can move to on any turn. Tiles you can shore up will display a little sandbag icon, and when you tap a card to give it to somebody else, eligible players (on the same tile) will get a message to tap to accept the card. When you’re out of actions, an unobtrusive message will say so, and the treasure cards deck will glimmer to remind you to draw cards. After that, when it’s time to draw Flood cards, there will be a “Flood Alert” message and the Flood deck will glimmer. Oh, and another key feature: the Undo button. When you play Forbidden Island , quite often you try out a move, and then reconsider and move in a different direction, or realize that maybe a better plan of action is better. The app allows you to move around, shore things up, give away cards, play special cards … and then undo any of that, as long as it’s still your turn and you haven’t already drawn new Treasure cards. It’s a nice feature that lets you plan your moves by playing them out, rather than having to do it all in your head. There are some extra little animations and sound effects thrown in: splashes and sloshing when tiles get submerged or sink, a little shuffling and dealing sound when a discard pile needs to be reshuffled, and so on. When you use a helicopter card (which allows you to pick up any number of people from one tile and transport them to another), you actually get a little animation showing the helicopter and pawns, letting you choose which people will fly away in the chopper. The animations are a mixed blessing: it’s fun, but sometimes it slows the game. If you’re somebody who wants to just play quickly, it would be nice to have an option to shut off the animations or speed them up, at least the shuffling/redealing bits. 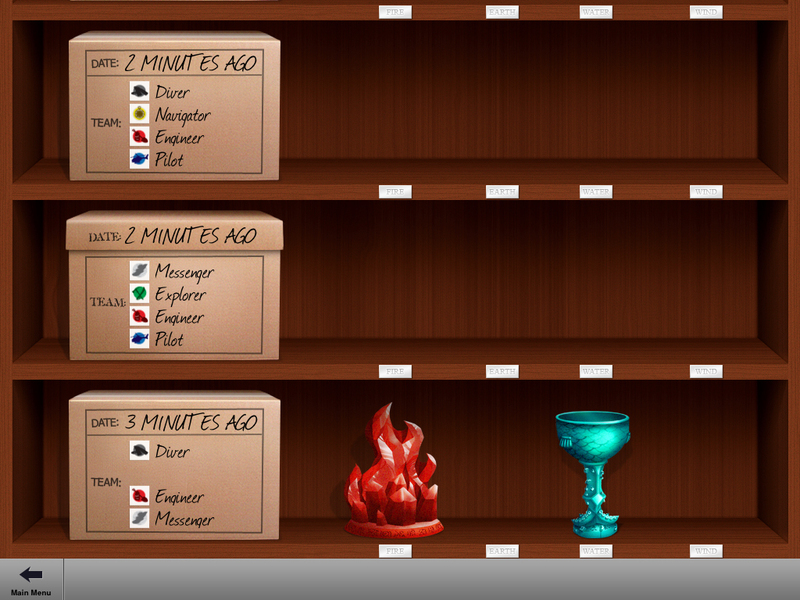 Saved games "shelf" showing players and retrieved treasures. The ability to have multiple games saved is nice — when you use the “Resume Game” button on the main menu, you get a view of shelves: each box has the date (or time, if it was today) that you last played a game and the roles participating in the game. Next to that are images of the treasures already claimed in that game. If you put in custom names for each player, the names will show up as well. (One thing I’d like to see in addition is the difficulty level.) As a fun touch, if you pull down past the top shelf, you’ll see a metal Forbidden Island game tin sitting on the top. The game also throws in some achievements: things like using each special power for the first time, or winning a game without using any powers. It’s unnecessary, but throws in a few more objectives as you’re playing the game, if you like that sort of thing. There is a tutorial that walks you through the game, and you can read the rulebook from the main menu. Overall, it’s a nice app that faithfully reproduces the game, adding a few fun features. While I think some players (especially kids) may enjoy the animations and sound effects, they might not be for everyone. It’s definitely nice to have the computer tracking all of the procedures and number of tiles to sink and so on. If you haven’t played Forbidden Island yet and you’ve got an iPad, the app is a cheaper way to try it out and see if you like the game. If you already like the board game, this lets you make the game even more portable (and gives you the option to pause and resume games at will).